A growing bamboo enterprise is owned by Michael Gebru, an Ethiopian entrepreneur who set up the Bamboo Star Agro-Forestry Company in western Ethiopia, 700 km from Addis Ababa – a rural area of vast bamboo forests and a lack of jobs among the rural population. Bamboo Star has a monthly production capacity of producing 10,000 square metres bamboo flooring, 3500 doors, 480,000 sets of chop sticks and 24million toothpicks per month. This provides jobs for 200 people in the factory and 500 in the forest, a figure which will soon increase to a total of 1,000 employees. 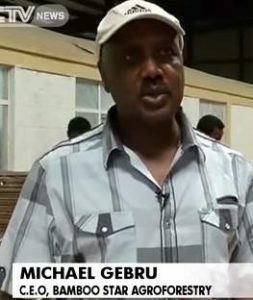 Gebru, leases 400,000 ha of land from the government, has forged close ties with China, who provided training to build workers’ skills in bamboo processing, and Saudi Arabia who, with Chinese investors, will provide funds to planning to set up the largest pulp and paper mill in Ethiopia using bamboo fiber. Gebru has hit on a successful formula for stimulating interest among local farmers. Bamboo Star distributes to planting material to them free of charge from a nursery owned by the company and buys back the bamboo culms two when the plants are at the productive stage, typically after 3 years, for processing in his factory.